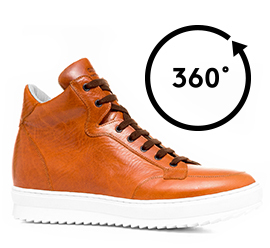 Named " Worth Avenue " The new elevator sneakers in natural tanned cognac full-grain leather by GuidoMaggi. The specific treatment used gives the shoes a vintage effect. The warm inner lining made of soft goatskin, ensures maximum comfort. The insole is made of genuine Italian leather while the white outsole of the latest generation is super light rubber with anti slip. The invisible and anatomic increaser - depending on needs - can be selected from 6 cm, 7 cm, 8 cm, 10 cm. GuidoMaggi's artisans allow a range of possibilities for customization.